In the early 1950s, American-born Jan Wilsgaard designed the Amazon, a car that was to transform the fortunes of Swedish carmaker Volvo. The Amazon provided the genetic heritage that ultimately led in the 1990s to the brutal, boxy, world-beating touring car racer, the 850 T5R estate. On the way, it passed through the smooth, elegant six-cylinder 164 (another of Wilsgaard’s designs), the classic rally-ruling 144 and even the angular, rather worthy hairshirt-special 240. The Amazon and its progeny were all basic, solid, unbreakable and almost infallibly reliable. They have been known to run for miles on minimal compression, dreadful quality fuel and with half a farmyard in the carbs (the later, injected cars weren’t exactly temperamental either). No matter what, a traditional, Amazon-derived Volvo keeps going. And if there was an equivalent to the multi-faceted, enduring Amazon in Watchworld, it would be—without a doubt—the ETA/Unitas cal. 6497/8. You’ll find the cal. 6497—functional, undecorated and sound in finest Amazon tradition—in base model Glycines. You’ll see it tuned and tweaked in 123GT-style as Panerai’s OP I, II, X and XI in everything from the PAM111 to the PAM292. And you’ll spot it in lightweight, T5R racing form as the skeletonized, decorated and pimped-to-the-max Maurice Lacroix ML-16. Meanwhile, Michal Molnar and Igor Fabry turn the movement into high art—more Venturi than Volvo—in their Slovakian atelier. It gets around, does the 6497. The heavily modified Unitas 6497 powering the Time Machine Extreme from Molnar Fabry. Like the Amazon, the 6497 started out in the 1950s and it’s a bruiser of a movement at a chunky 16.5 lignes (36.6mm) across and 4.5mm deep. If you’ve ever looked at a Panerai and wondered why it has the rather unusual feature of a subsidiary seconds at nine o’clock, it’s because the 6497 derivative powering it was intended as a pocket watch engine. Rotate your 6497-powered wristwatch so that the crown is at 12 o’clock and you’ll see the subsidiary seconds in the standard pocket-watch position at six. The cal. 6498 was designed for a hunter case, so it has the sub-seconds dial in a different place. Because the protective case-front of a hunter is usually sprung-pivoted at Six, to open it easily you’ll usually hold it with the crown (which you would press to open the case) at three. When the cal. 6498 movement is transposed into a wristwatch, that means you get the sub-seconds at the more conventional six o’clock. You’ll find a cal. 6498 behind the case back, admittedly decorated and smartened up, in the TAG Heuer Carrera Calibre 1 or in one of Roland Kemmner’s excellent value Mechanik watches. Want a date? You’ll need the cal. 6503. 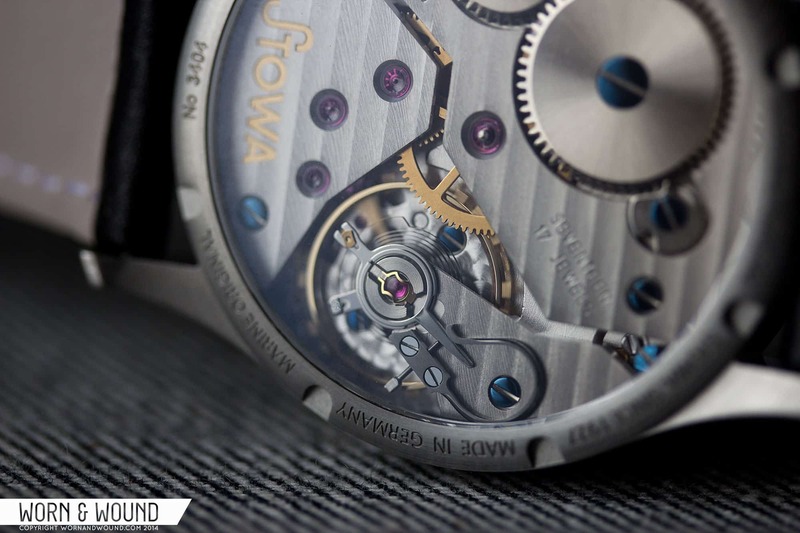 As well as the 97/98 variants, ETA makes the movement in two main specifications. In typically imaginative fashion, there’s the 6497-1 and the 6497-2, both with 17 jewels. The 1 gives you 46 hours of power reserve and, as the more trad of the two engines, a leisurely beat rate of 18,000. With so many modern watches running more frenetically, a 6497-1 is really rather relaxing to listen to. The 6497-2 often arrives in a dinner jacket (tux, to my US pals) with a smarter level of decoration and a faster balance at 21,600 bph. It also runs for slightly longer with a 53-hour power reserve. That’s because the mainspring powering the 6497-2 is longer than the one in the 6497-1 by about four inches. Those power reserves are useful, too. That’s because the cal. 6497 is a movement that encourages interaction. There’s no self-winding option, so it’s back to good old-fashioned keep-fit manual winding. A lot of people are sniffy about hand-winders, thinking them basic and a little agricultural, but there’s something involving about taking time to wind your watch each morning—a sort of meditative few moments before you launch into the day. There’s no wobbly weight to obscure the movement from view either. And even if you don’t buy that, the winding mechanism on these movements is so well-engineered and smooth that getting them going is a pleasure for anyone with mechanical sympathy. But don’t be fooled into thinking that this is just a chuggable, basic old tractor of a movement. The solidity and weight that makes the 6497 so reliable also lends the plates to skeletonization and decoration that would crumple lesser movements like a paper bag. Just look at a few of those Molnar Fabry watches to see what’s possible. Practically, it’s an eminently regulatable movement, too. It can be a little hard to set accurately (it’s non-hacking), but once you do you can often see remarkable performance. There are plenty of reports of plus/minus one and two seconds a day from a standard minus one. Not shabby for a movement that costs under $200. Those large bridges and solid plate make for a stable platform indeed. The Unitas 6497 is the base movement of Christopher Ward’s JJ02 Single Pusher Chronograph. Invest in a watch running a cal. 6497 and you’ll never need to worry about servicing or parts costs. Most trainee watchmakers cut their teeth on the movement, simply because its size makes it simple to learn the principles of horology. And almost every techie will have a drawer full of bits to fit. But it’s this very ubiquity, simplicity and robustness that ends up damning the 6497 family for some watchies. They ask how can makers justify putting a movement costing a derisory $200-400 in a watch that then retails at several thousand dollars? To be fair, these versions of the 6497 are often extensively re-worked with different balance, bridges and decoration—but not always. A swan neck regulator on Stowa’s Marine. Of course, the value of a watch isn’t only in its movement. Just compare the cases and dials, for example, of a bargain-bin crowdfunded special and a top end chronometer. And there are plenty of people who’d take a standard movement over an in-house, with its potential parts and servicing issues. There’s not enough space to have the debate and answer it here. But what’s certain is that the cal. 6497 doesn’t simply deserve to be dismissed as a bit of agricultural history that has somehow survived the onslaught of ultra-complications and haute horlogerie snobbery. It stands in its own right, with a clear heritage and role. And, no matter in what form, it’s a sound, versatile, engaging belter of a movement. Mark developed a passion for watches at a young age. At 9, he was gifted an Omega Time Computer manual from a local watch maker and he finagled Rolex brochures from a local dealer. Today, residing in the Oxfordshire village of Bampton, Mark brings his technical expertise and robust watch knowledge to worn&wound.